Early spring on the ranch has come and gone. This year my Yellow Butterflies magnolia bloomed for the first time since I planted it three years ago, and of course, the tulips, the forsythia, the heavenly daphne rewarded all my hard work. It’s a charmed time of year. 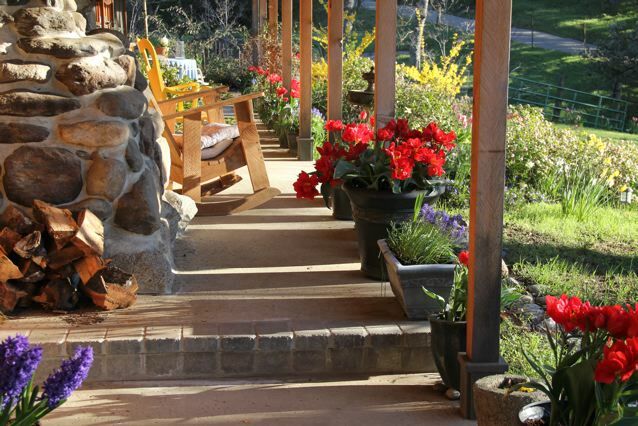 I can relax on the porch, coffee cup in hand, all the stooping and planting of last fall forgotten. Here’s my favorite place, facing the morning sun, looking out for the first orioles, the hills still in shadow, the fountain gurgling. This is where I bring my notebooks to jot down everything from dreams to garden ideas to character biographies for my next books. These flowers fade, and then the dogwood blooms along with the lilac by the fence, which, every time I pass it, reminds me of when Dave and I lived in New England. 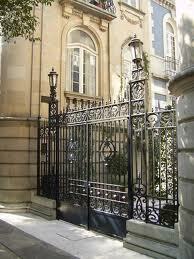 For a moment each time I go through the gate, I’m forty years younger. What have I learned in those years? Wow! A lot! Most important thing? I wouldn’t have worried so much when I was younger, I think, if I’d known happiness could be had with a few bulbs, a lilac bush, hard work and a good book. 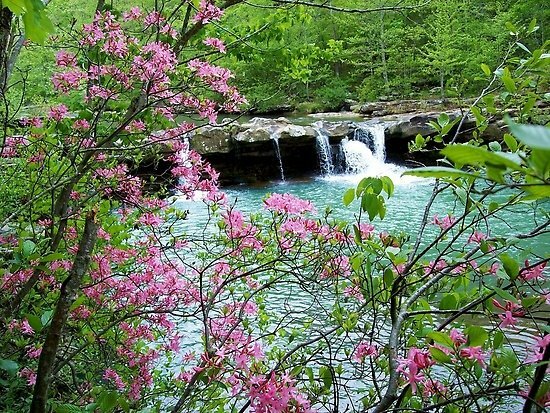 Oh and one more thing . . camping by a river— something like this when the wild azaleas bloom. Now that the purple Chinese Houses and the yellow Madia are blooming along the roadside, I know it’s time to plant the garden. I made this soup with my summer vegetables in mind. It’s from Ina Garten—the Barefoot Contessa. You can go to her website , or you can get it here. One word: do cut the carrots into small pieces. Another thing—You can use vegetable broth if it’s homemade. Can’t stand the canned stuff myself. Directions: Heat olive oil, add onions and saute over LOW heat for 10 minutes, or until onions are translucent. Add leeks, potatoes, carrots, salt, pepper and saute over medium heat another 5 minutes. Add broth and saffron, bring to a boil and simmer uncovered for 30 minutes, or until vegetables are tender. Add haricots verts and spaghetti, bring to a boil, and cook for 15 more minutes. While the soup simmers, make the Pistou. Process garlic, tomato paste, basil, cheese in a food processor. With motor running, add oil slowly through the tube to make a paste. Before serving, add a 1/4 cup of pistou to the soup and stir. Serve soup with warm, crusty French bread, extra parmesan and pistou for those who want it. After dinner, relax with a glass of wine and listen to . . .
Today I’m going to show you a little You Tube video of the famous chef and — what can I call her? — the great food historian Diana Kennedy. You’ll be reading a lot about her. She was just given the James Beard Award for the best cookbook of the year for Oaxaca al Gusto. The You Tube is in Spanish and is an interview for the, I guess, Mexican version of the AARP. It would be too tedious for you to read a whole word for word translation, so I’m just going to give you the gist. 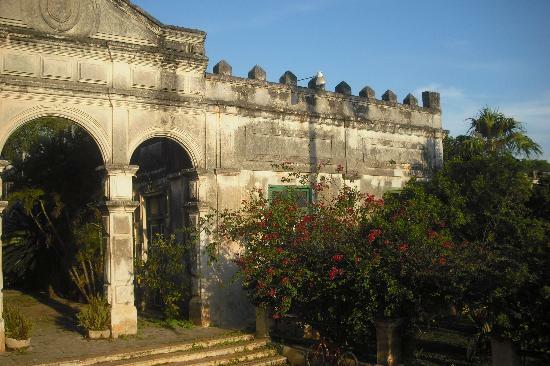 Zitacuaro is home to the Monarch Butterfly Sanctuary high in the moutains of Michoacan at ten thousand feet. The story of these delicate creatures’ migration is worthy of its own post. I’ll just show this picture on the right to give you the idea of Diana Kennedy’s whereabouts. Alas, Michoacan is pretty much ground zero for the drug wars. That’s the other reason I’m showing this particular You Tube video shot, I presume, this year. Mrs. Kennedy seems pretty much like she’s going on with her life, which is what my friends in Morelia, Michoacan tell me they are doing. What Diana Kennedy is VERY worried about and what she talks about in this video and other videos, as well, is the loss of Mexico’s culinary traditions and local foodstuffs. Recently, the Mexican government has been allowing the importation of things like hibiscus flowers, used for agua de jamaica, from Yemen and chilis from China. This, Kennedy says, will have a disastrous effect on regions of Mexico. As UNESCO just named Mexico’s cuisine one the the world’s heritages, it’s incumbent upon all of us who travel to Mexico to support the local farmers there as we do here. “Mexico must protect this jewel of its culture,” Kennedy says. But on to the You Tube translation. She goes on to talk about leaving England in 1953, of travelling to Haiti where she met her husband, Paul Kennedy, the New York Times correspondent in Mexico and Central America, about travelling throughout the region during the fifties with her husband under extreme conditions. When Paul Kennedy died in the mid sixties, Craig Clairborne, encouraged Diana Kennedy to give cooking classes in New York City, which she did. 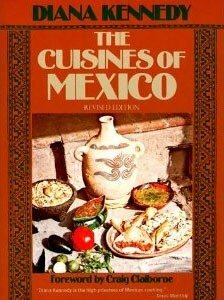 She travelled in Mexico six months a year, gathering recipes, and those recipes were included in her first cookbook, The Cuisines of Mexico, an absolute classic. 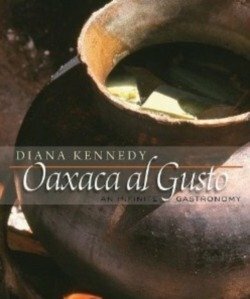 The recent cookbook Oaxaca al Gusto took fourteen years to complete and was eventually published by a university press after the first publisher refused to cooperate with Diana Kennedy’s requirements. She insisted that the recipes include the stories of the people who gave them to her, that the history of the recipes be preserved. She is a force to be reckoned with, and the world is a better place for it. Another woman who refuses to do what she’s told!! Hooray. And tonight for dinner, I’m making a special mole amarillo or yellow mole from Oaxaca in honor of Diana Kennedy’s book. I’m using the chilhuacle chilis I grew in my garden last summer. I had to grow them, because you can’t find them in the markets in the states. To use them, dry them for several hours in the oven as chilhuacle chilis are only used dried. It’s something Lili might be served when she dines at the restaurant on the above right with Gabi and Hanes, don’t you think? By now you may have heard that the US State Department has released its current Travel Advisories, and its not good news for traveling to Mexico. I’m aware that Mexico is seen as a dangerous place. Don’t think I have my head in the sand, but I’ve been there three times this year and have felt completely safe. It’s true that I speak the language well enough, and I have friends there. Maybe that makes it easier for me. Anyway, it’s a perfect time for some armchair traveling. 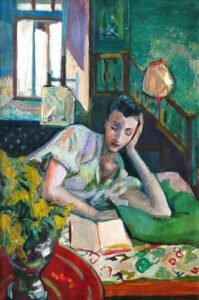 You can let Lili face all the danger while you are safe at home reading in bed, well in this case, listening to Palace of the Blue Butterfly. Why, you might ask, did I choose Mexico City as a setting in the first place? There are two answers to that, really. One is personal. When I was seventeen, my mother and I took off for Mexico City in her huge Buick Elektra. It was a road trip moment, and we were getting out of Dodge! Anyway, I fell in love with Mexico. It’s that simple, early imprinting and all that. The second reason? Well, that has to do with the craft of writing, with the essential element of conflict. Once I had the setting for my book, I had the conflict. What was my character doing there? Whom would she meet? Where would she go? And I wanted to follow, to peer over the forbidding walls and get behind the high, iron gates, which is exactly what I did. People have been so helpful you can’t imagine. 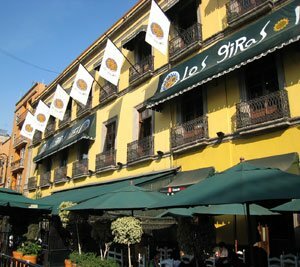 If you’ve followed along this far, you know that Lili is invited to a residence in a super excusive part of Mexico City called San Angel. ( See photo left) Who wouldn’t want to be driven down this street in a Mercedes with smoke-colored glass, have the chauffeur hop out and ring the buzzer, and be allowed into a whole other world? Well, click and listen and you can.